Well I know that there are going to be a lot of posts about this over the next few days (and I have already read a fair few myself), but it’s been a while since I last wrote a baseball post and I can’t stop thinking about this one. Last night, the long investigation was finally over and the news came out that A-Rod and 12 other players have been suspended for their links with the now-defunct Biogenesis clinic. There were three other players implicated (Bartolo Colon, Yasmani Grandal and Melky Cabrera), but they have already been suspended for taking PEDs and were considered to have served their punishment. A-Rod, rather than a 50 game suspension, received a 211 game suspension, which takes him through to the end of the 2014 season, although he is now appealing the decision meaning he can play in the meantime. He was suspended for longer than the others due to “attempting to cover up his violations of the Joint Drug Prevention and Treatment Program by engaging in a course of conduct intended to obstruct and frustrate the Office of the Commissioner’s investigation”. Now I don’t know about you, but if I was being paid $29 million a year, and I had already admitted to taking steroids in the past (leading to the nickname A-Roid), I would try my damnedest to stay clean and not risk being caught again. A-Rod now says that he is “fighting for his life”, but what he is actually fighting for now is money and reputation. And unfortunately, even if his suspension is overturned, I think he has lost his reputation for good. There’s only so many times that you can be linked to steroids before people start to believe that it must be true. The most baffling thing to me though, is that he is a 14 time All-Star and 3 time MVP award winner. He obviously started his career well; the contract he signed after the 2000 season made him the highest paid player in sports history – a 10-year deal worth $252 million. In 1998 , when he was just 23 and in his 3rd full major league season, he was selected as Players Choice AL Player of the Year, won his 2nd Silver Slugger Award and finished in the top 10 in the MVP voting. If you’re that good, why risk it all by doing something that would jeopardise your whole career. And then if you admit it once, DON’T DO IT AGAIN! You cannot claim to be “fighting for your life”, if the situation is entirely of your own making. I’m usually a firm believer in ‘innocent until proven guilty’, but I was burned by this with Ryan Braun, defending him to the hilt only for him to come out a year later and admit that actually, he did take steroids and he tried to cover it up. On a side note, I believe that the 65 game suspension that Braun received this year should have been doubled because of the way that he appealed the decision last year and blamed it on a poor Fed-Ex guy who was just doing his job. 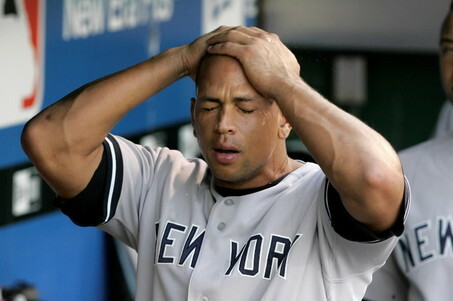 A-Rod appeared in his first game back from injury last night, against my team the Chicago White Sox. And was promptly met with boos and chants of ‘PED’ and ‘Steroids’ during every at bat. And I think that until his appeal is over, he can expect that every time. People have lost faith with players linked to steroids and don’t want to go back to the position that baseball was in during the 90s when it seemed that pretty much every player that was beating records and doing well was juicing to get there. I wish that A-Rod had just accepted his suspension like a man and then decided whether he wanted to come back after or not. But he’s 38 now, meaning that he would be 40 by the time his suspension was over, and although he’d still have 3 years left on his contract with the Yankees, the chances of him getting regular playing time against the younger players would be greatly diminished. But by appealing now, it means that when if he does get suspended, he’ll have gone out on a playing streak rather than going out on the injury list. I wish him all the best, but for the sake of the game, I hope he will change his mind and take it like a man.